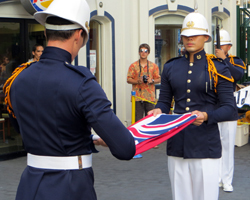 Nightly Hawaiian Kings Guard changing ceremony in Waikiki. Hearkens Back to Days of Hawaiian Monarchy! 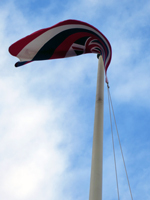 The Hawaiian monarchy was overthrown in 1893. 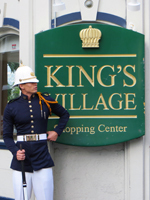 But you can still experience a small part of regal Hawaii history every evening at the King’s Village Shopping Center, when the honorary King’s Guard Drill Team executes a late-nineteenth century style King’s Guard changing ceremony. 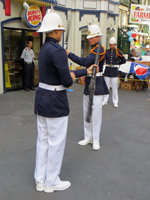 This formal rite was established to restore and safeguard Hawaii’s unique past by featuring an award-winning exhibition drill team in authentic uniforms from the period. Sure, it’s performed for tourists; which might make it seem a little Disney-esque. But let’s face it… the nineteenth century has been over for more than 100 years. Anything set in that era is, by default, theatrical in nature. That shouldn’t stop you from enjoying some free Waikiki entertainment and snapping some fun Hawaii activity photos! 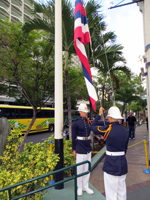 The actual King’s Guard changing ceremony, which includes a flag lowering and rifle drill exhibition, is billed to be the longest-running daily event in Waikiki! And though this attraction was inaugurated in 1972, its tradition evolved from the Hawaii Reserve Officers’ Training Corps (ROTC) exhibition drills that became popular in the 1920’s and 30’s. Because Hawaii is the only U.S. state to have a royal palace, this truly is a one-of-a-kind experience that visitors can not witness elsewhere in the United States. The uniqueness of the event is further magnified by the geographic isolation of the Hawaiian Islands. With limited outside influences, early drill team members were forced to imagine and invent new variations on traditional routines. This has given the King’s Guard changing ceremony a distinctly Hawaiian flavor! After not seeing this Hawaii attraction for many years, I was finally down in the right part of Waikiki at the right time on a Friday evening. I was all set to take pictures for this page when they explained that the full guard changing ceremony is only performed on Tuesdays, Thursdays, and Sundays. D’oh! A smaller, flag-lowering ceremony is performed on the other days; and that’s what is shown in these pictures. Nevertheless, the skill and discipline displayed in this routine is impressive. But from what I recall, the full ceremony is even more inspiring. Either way, it’s a privilege to witness the authenticity of the uniforms, the formality of the ceremony, and the disciplined precision with which they execute their drills. After watching the King’s Guard changing ceremony, you can take your picture with a guard. Then be sure to stop by the free King's Guard Museum for a brief look at guard memorabilia. It will hold more significance for you once you’ve seen the drill exhibition.